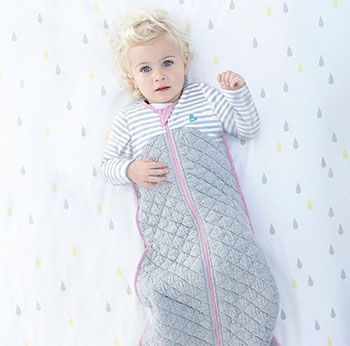 This 2.5 TOG premium warm Sleep Bag with arms has a built-in quilted blanket, with 100% natural cotton outer & lining, for added warmth in cooler temperatures.This sublimely soft & comfortable sleep bag has extra room for kids who love a roomy blanket. It has light upper chest fabric to help reduce risk of overheating and mesh vents under arms for increased air flow & better temperature regulation. LUX KNIT™ quilted blanket & sleeves for added warmth. 0 6 - 12 months 75 cm / 30"
1 12 - 24 months 86 cm / 34"
2 24 - 36 months 94 cm / 37"
3 36 - 48 months 104 cm / 41"
The Love To Dream™, Newborn to Toddler Sleep System, provides the highest level of quality with trusted sleep solutions to the very real parenting challenge of better quality and longer sleep for the whole family. Millions of parents across the world have come to learn that Love To Dream™ products really work! In 2017, from a field of 2000 Australian businesses, Love To Dream™ was honored as a top 20 Winner of the Westpac Businesses of Tomorrow Award. The award recognizes the top 20 companies that are shaping Australia’s future through leadership and innovation.